Based upon our expert engineers coupled with advanced technology, we present domestic usage cross trainers. These trainers have defect free structure demanding less maintenance. These are manufactured from top grade materials in accordance with set parameters and standards. These are available at most competitive prices. 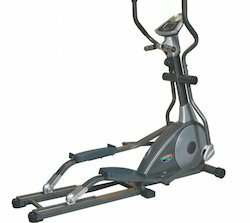 Our range of cross trainer includes iridium avant commercial and domestic gym equipment. Keeping in sync with time, we are able to offer Iridium Avant to our clients. The offered range of iridium avant commercial is developed utilizing high grade raw material and innovative techniques in complete adherence with the industry laid norms and standards. Moreover, the offered range of iridium avant commercial is appreciated for its over sized frame and anti slip foot pedals.